What should my child wear inside his Zizzz baby sleeping bag? 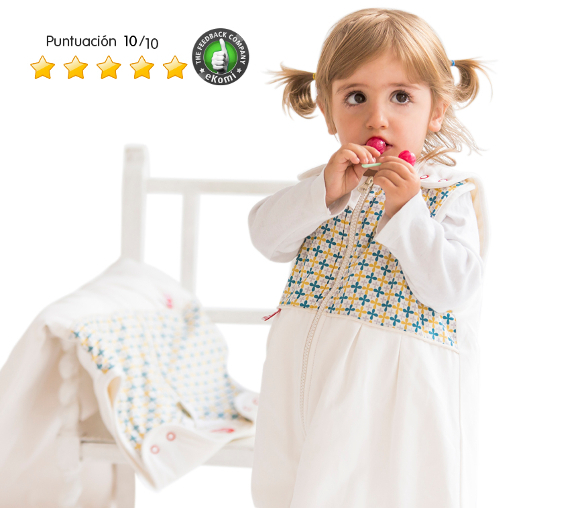 We advise parents to dress their baby in pyjamas made of natural, breathable materials. During particularly cold periods, put an extra layer on your baby. What is the ideal temperature for my baby's room? When I put my baby to bed, should I use a blanket or a baby sleeping bag? We recommend that you use a baby sleeping bag. It is the safest and most comfortable way for a baby to sleep. It is the most comfortable way, as babies can’t kick off a sleeping bag, so there is no risk of them uncovering themselves and waking up from the cold. It is the safest way, because babies cannot suffocate in a baby sleeping bag; unlike a blanket, a correctly-sized bag will never smother the baby. In addition, the repeated use of our baby sleeping bag provides your baby with a recognizable sleep environment, which has a relaxing effect. This feeling of familiarity will, in turn, help them establish a sleeping routine, even when they are not in their own bed. We recommend our blankets for other uses, too. You can use one keep your baby warm when you are carrying them or when you take them for a walk in a buggy. Why don’t your baby sleeping bags have sleeves? Our bags don’t have sleeves to make sure enough air can circulate and to avoid overheating, which can be a cause of Sudden Infant Death Syndrome (SIDS). If babies sleep under a blanket they will normally keep their arms uncovered, just like we do. We recommend layering garments to adapt your baby to their room’s temperature. The best way to see if they are warm is to put your hand on their chest or behind their neck. Babies’ hands can feel a bit cold because of poor circulation in the first 12 months. Don’t worry! This is normal. How do I take care of my Zizzz sleeping product? You can wash Zizzz products at 30ºC on your washing machine’s wool program. Remember to use a wool detergent. Do not put Zizzz sleeping products in the dryer. Can I use Zizzz sleeping products for a baby with allergies or eczema? Absolutely! At Zizzz, we only use natural materials: Swisswool and organic cotton, both of which are hypoallergenic. Skin allergies are often linked to chemical and toxic residues in fabrics. The wool filling in our sleeping bags comes from sheep raised in the Swiss Alps. No pesticides are used on our sheep. The inner lining of our baby sleeping bags is made from organic cotton, which we use to ensure that there is no chance that pesticides come into contact with your baby. What is the TOG value of a Zizzz baby sleeping bag or blanket? The textile industry uses TOG values as an indicator of a product’s insulation power. You’ll often see TOG values listed on baby sleeping bags made of polyester. We don’t believe it’s very useful, since our products are breathable and help to regulate your baby’s body temperature naturally. However, if you twist our arm, our TOG value is roughly 2.5. Until what age can a baby/child sleep in a baby sleeping bag? Our baby sleeping bags come in three different sizes. Our largest sleeping bag is for children from 2 to 4 years; the smallest size is for the period of 0 to 6 months. During their first six months, babies grow very quickly, which is why the use period of our smallest model is relatively short. Our second size is for 6 to 24-month-old babies. We don’t make our bags too big, because then they essentially become a blanket. This defeats the entire purpose of a sleeping bag, which is to ensure that the baby can't smother itself or kick the sleeping bag off. How many bags do you recommend? It is best to have two baby sleeping bags. This way you always have a back-up when one is in the washing machine. Can I use your baby sleeping bag all year round? Yes. Our bags are designed to be used year-round in houses with temperatures between 16° and 22°C. So, it’s best to avoid using them on the hot summer days, when you sleep yourself without your duvet. Take advantage of our latest promotional offers!